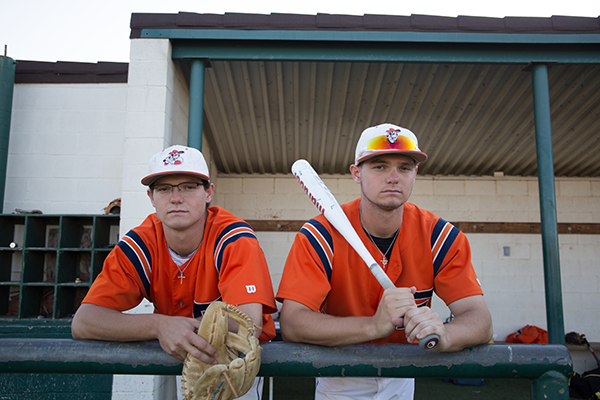 Tyler Foy (left), a pitcher, and Tanner Foy, first basemen (right). Photo by Alejandra Rosas/The Et Cetera. 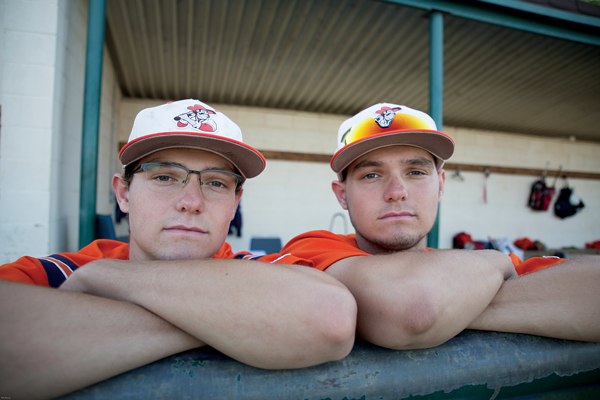 Identical twins Tyler and Tanner Foy were 7 years old when their grandfather introduced them to baseball. Many afternoons were spent playing catch, and their love for America’s pastime only grew as they got older. Everything about them screamed baseball: their upbringing, their passion and their physicality. Eastfield coach Michael Martin saw this. Moving from Venus, Texas, to Mesquite in 2015 was a big jump for the Foy twins. But they knew that playing for the Eastfield Harvesters, a team with three national titles, would be worth the journey. As seniors at Venus High School just the year before, they made history by advancing to the regional semifinals, one game within the state round. Everything seemed to be going well for the Foys. Then the injuries happened during the Harvesters’ 2015-2016 baseball season. Early that fall, Tyler tore the ulnar collateral ligament in his right elbow. His pitching arm was no longer useful, and his season ended before it began. He underwent the Tommy John surgery soon after. Tanner cemented his place as a starter at first base, but his season was also cut short after just six games when he suffered a fractured femur. The brothers knew they would lose a year of eligibility if they didn’t step down, so both opted to medically redshirt themselves. Now, as college sophomores, they are getting a second chance to play college ball, again as freshmen athletes. Martin said that both their injuries set them back emotionally, and now they want to make up for lost opportunities. Despite their injuries, their love of the sport gave them hope for the future. Karen said baseball defines them now, but they were actually pursuing a different sport when they were younger. After their grandfather introduced them to baseball, their ties to the sport never faded. Tyler hit his first Little League triple when he was 7 and threw his first-ever no-hitter at 15. Tanner’s father, David Foy, bragged about his son’s consistent hitting record. “Tanner has come through with clutch hits his whole life when a game was on the line,” David said. Tanner only began playing on first base as a high school sophomore, being an outfielder prior to the change. The Foys now room with starting pitcher Paul Bowman, whom they consider a brother. The twins deliver pizza for Domino’s on the weekends while in season. Juggling school, baseball and work has often been hard for them, but they said they would always support each other. Karen said their bond as brothers helps fuel their competitive side and feels they are better when on the field together. Photo by Alejandra Rosas/The Et Cetera. Both twins want to major in business administration and entrepreneurship. Their goal is to one day own their own fast food chain. Tanner said it’s great having someone who shares the same goals in life as him, but they do have their differences. Martin said he would like for both to be more vocal. He believes they can become leaders for the team this season and maybe the next.